99% of my print customers purchase their prints online through this website. Ordering online is safe and secure, shipping is free, and quality is guaranteed! I also offer several unique archival display options, which are clean and modern-looking alternatives to traditional framing. Duraplaq mounting is my most popular display option - an affordable, glass-free, wood-mounted and UV laminated style which greatly reduces glare and is easy to clean. Another option is my Acrylic-glass mounting, which offers the ultimate in image clarity and vibrancy. My glossy Metal prints have a similar glossy vibrancy and a special depth of imagery. I guarantee the high quality of all of my prints. The prints are packaged securely and will arrive within 3-4 weeks or sooner, with free shipping in the US and Canada, and free international shipping for print-only, Acrylic-glass-mounted prints, and Metal prints. Not sure about ordering artwork online? Check out my print collector testimonials below. My prints have been purchased by satisfied customers in all of the lower 48 United States and a dozen countries. You can order prints on this website, directly from each photo's page in the galleries. My loose (unmounted) print orders are printed on archival heavyweight Hahnemühle Baryta paper with a semi-gloss, slightly textured surface and white borders around the image to make it easier for matting and framing. The loose print orders are usually shipped flat except for the largest sizes which are carefully rolled and packaged in a box. Extreme care must be taken when handling the loose prints to avoid water damage, fingerprints, or creasing prior to framing. In fact I recommend taking the prints directly to your local framer even before unpackaging - particularly rolled prints which can be difficult to repackage. I do not offer traditional framed prints for sale because of the difficulties of shipping glass. If you are interested in purchasing a ready-to-hang print whether for yourself or as a gift, please consider one of the mounted options described below which are equally if not more impressive and actually more economical compared to the cost of framing. 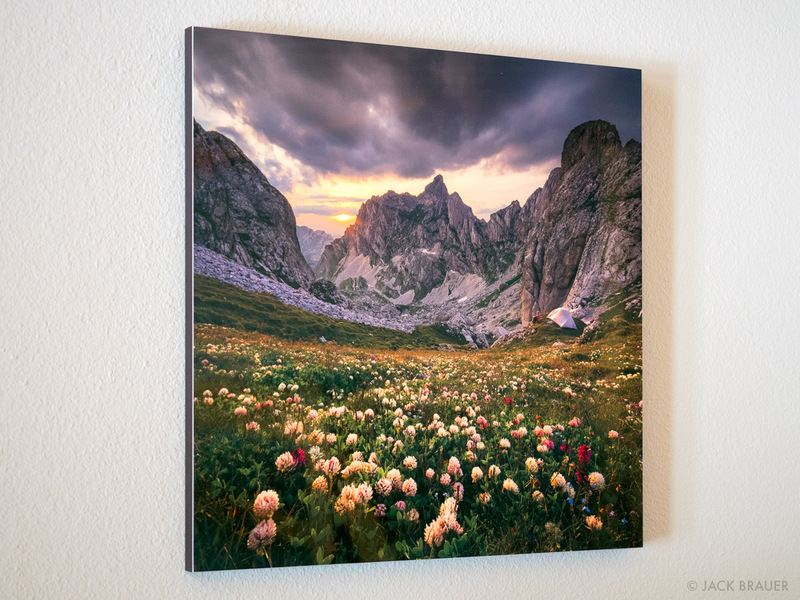 I am pleased to offer my prints with the professional print mounting known as "DuraPlaq" or "ColorBox" mounting - my most popular mounting option. The print is professionally mounted on a sturdy 3/8" high density, eco-friendly, smooth HDF wood substrate which is coated on both sides with an acid-free and moisture resistant barrier to prevent warping or discoloration. The print surface is sealed with a special fine-art-grade satin semi-gloss laminate, which eliminates unwanted reflections while maintaining excellent image clarity and contrast, and makes it UV, water, and fingerprint resistant. The mount is finished with a beveled 1"-thick black edge, resulting in an elegant, modern, and durable print display that hangs flush against the wall using an easy-to-hang french cleat system. 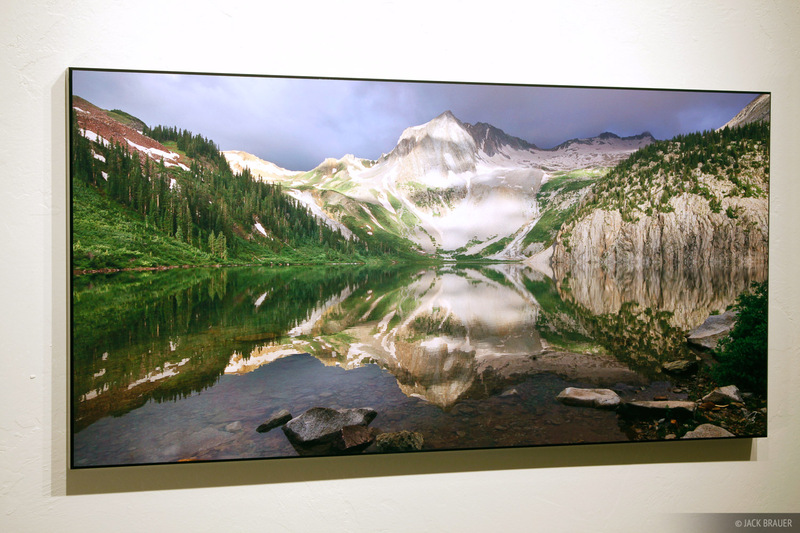 A 15" x 30" Duraplaq mounted print of "Snowmass Lake Reflection Panorama"
A big advantage of this mounting style is that the laminate has a semi-gloss finish which eliminates reflections, enabling easy viewing of large prints, even in bright rooms with harsh lighting - a situation in which prints are almost impossible to see clearly with normal glass frames because of the reflections. Indeed, the Duraplaq mounted prints seem to soak up light and glow with color. 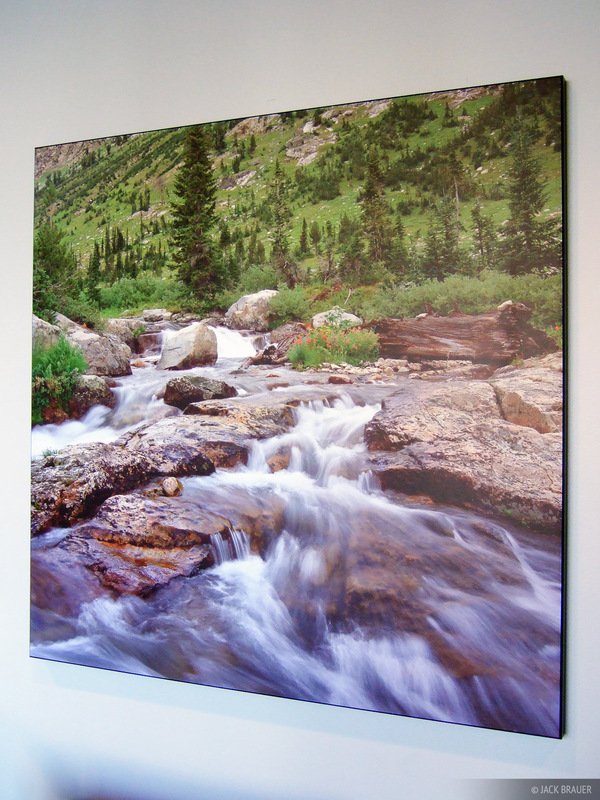 A 40"x40" print of "Tetons Cascade Creek". This print is hanging in a bright room opposite large wall- sized windows, yet the laminate cuts the glare making the print easy to view from all angles. A 46"x36" print of "Ice Lakes Basin Reflection". My large format prints add a lot of color to a room. A close-up of the mounting edge style. The print is mounted on a 1"-deep black box frame, and hangs flush against the wall. Duraplaq mounted prints are easy to take care of; you can clean them with glass cleaner (like Windex) and a soft rag. 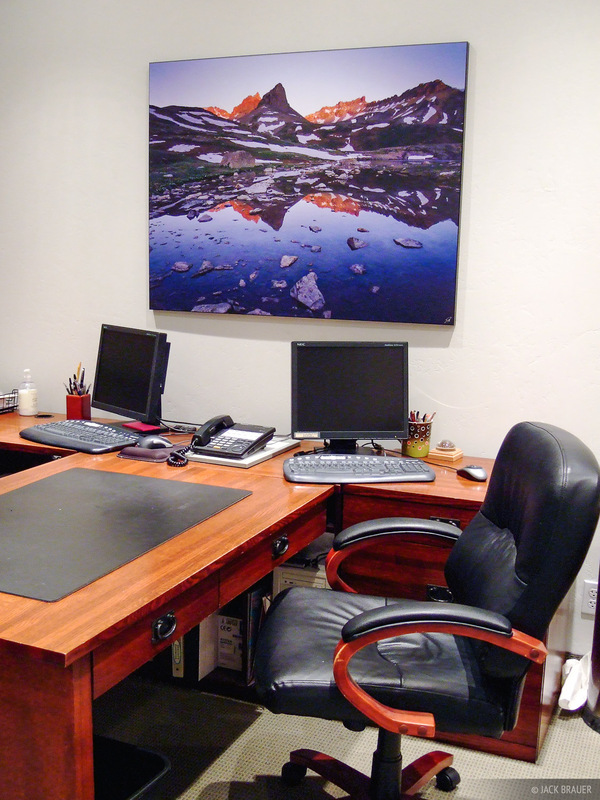 Click here to see many more example pictures of Duraplaq mounted prints. Imagine a traditional glass-framed fine art print hanging on the wall - but without the matte and without the frame, just the glass with the print behind it! This is what the Acrylic- glass mounting looks like. With this innovative display method, also known as PlexiGlass or Diasec mounting, a glossy metallic print is professionally mounted face-first onto 3/16" art-grade, UV protected, scratch-resistant acrylic plexiglass, and backed by 1/8" black acid-free board. A recessed french-cleat hanging system is attached to the back, so that the print floats 1/2" off of the wall, appearing like a glass framed print is floating on the wall without the matte and frame. The edges of the acrylic are clear frosted and beveled for a finishing touch. 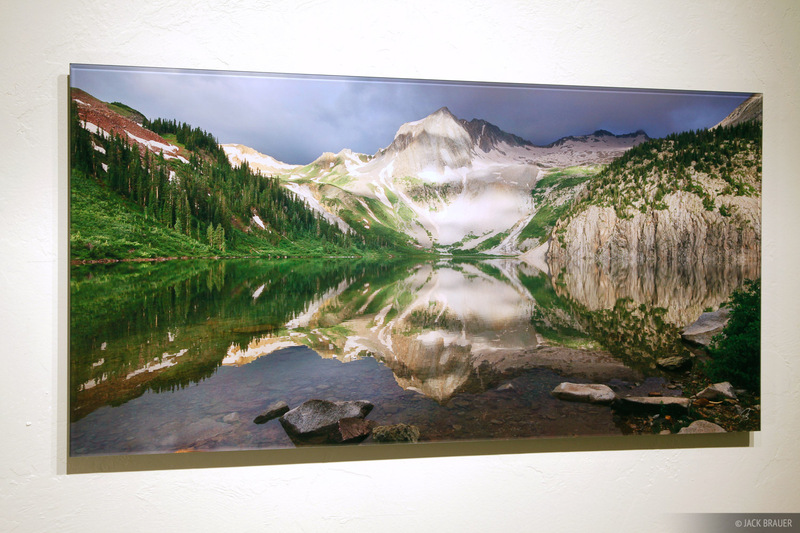 A 15" x 30" acrylic-glass mounted print of "Snowmass Lake Reflection Panorama"
Although the Acrylic-glass mounted prints are more expensive than my other mounting styles, they provide the ultimate in stunning image quality and elegant display style. 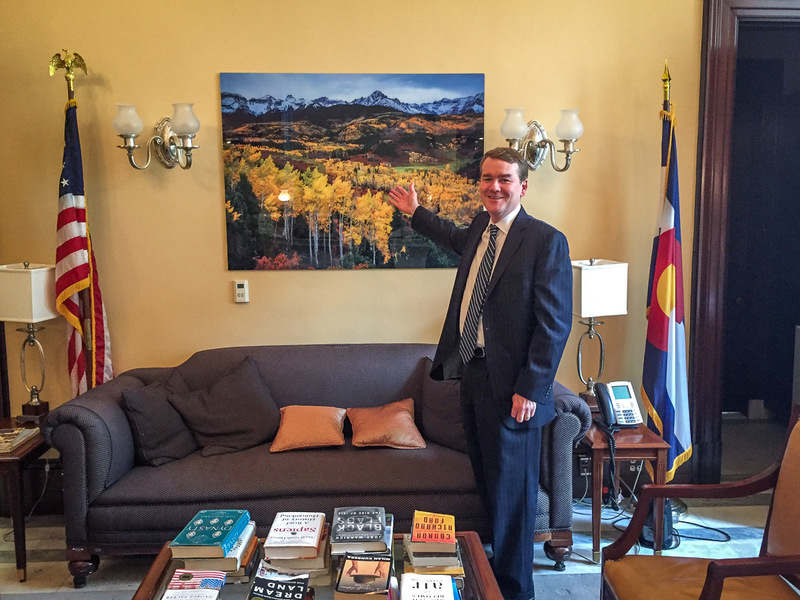 Colorado's US Senator Michael Bennet shows off his 40" x 50" Acrylic print of "Sneffels Range Autumn" hanging in his Washington D.C. office. A close-up of the acrylic mounting edge style. The edges are clear frosted and beveled, and the print floats 1/2" off of the wall. Metal prints are another unique and attractive display option that I offer. The photo is infused onto a thin, rigid aluminum sheet with a glossy finish that provides deep, bold colors with excellent clarity and high contrast. New in 2017, my metal prints are now mounted on an edge-to-edge 3/4" deep black metal frame mount. The frame looks great and makes the prints even easier to hang. 20" x 20" Metal print of "Wildflowers and Bobotov Kuk"
Unlike all my other display options which involve a mounted fine art ink print, the metal prints involve an entirely different dye sublimation printing technique. The image is infused into a polyester coated sheet of aluminum in a high pressure heat press. The dyes sublimate from a solid to a gas, and transfer to the metal print, where they solidify in the polyester coating. The way light shines through the surface coating and through the image itself gives the metal prints a unique sense of depth. With that sense of depth and deep dark blacks and vibrant colors, the glossy metal prints are very eye-catching, impressive prints - so lusciously glossy that they almost seem to be dripping wet! * Please note that due to the manufacturing process there may be very tiny imperfections in the metal print surface, but these are barely noticeable and don't detract from the dazzling appearance. I cannot accept returns due to these tiny but normal imperfections. Despite their popularity, I don't offer canvas prints through my website because frankly they just can't compete with the image quality and elegant display presentation of my other display options. That said, I do realize that some people prefer the look and texture of canvas wraps, so I offer them by special request. The canvas prints I provide are the highest quality canvas prints money can buy. 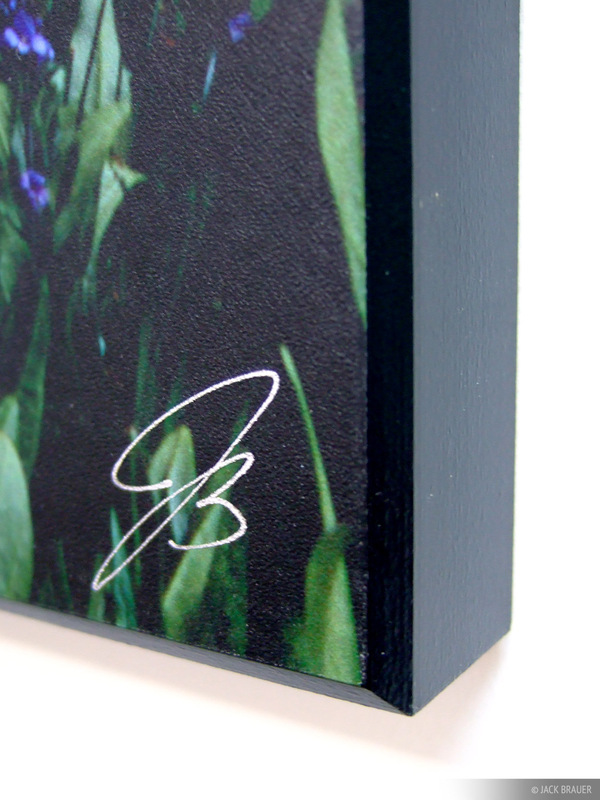 The canvas is actually mounted on a backing board which keeps the surface stiff and flat, preventing the sagging that can happen in cheaper canvas prints over time. By default the canvas prints are produced with solid black side edges, but the image can alternatively be "wrapped" or "mirrored" around the edges if you prefer. The pricing for canvas prints is exactly the same as my Duraplaq print options, so if you would like to order a Canvas print, please check out and purchase the Duraplaq option in the print size you'd prefer, then immediately contact me to let me know that you want a Canvas print instead. Can't Decide Which Mounting Option to Order? The biggest difference in my mounting options is the glossy versus satin semi-gloss surface. 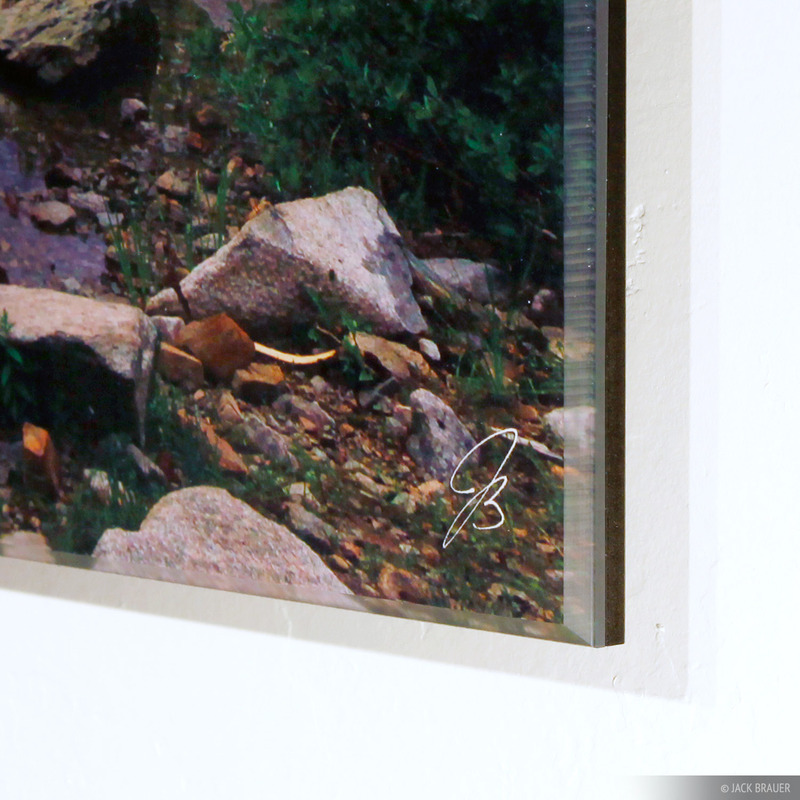 If you like shiny, glossy prints, you should choose either the Metal or Acrylic-glass prints. If you like the slightly more natural look of a satin finish, go for the Duraplaq mount. Keep in mind that ALL my print display options look their best under good direct lighting, such as halogen or LED track lights pointed directly on the prints. But, perfect gallery lighting conditions aren't always an option, so your expected lighting conditions are another factor to consider. The anti-reflective characteristic of the Duraplaq surface laminate enables you to see the entire image scene without distracting reflections, which makes the Duraplaqs a great choice for big prints hanging in rooms with large, bright windows - a situation where reflections can potentially be problematic with glossy prints. On the other hand, if the print may be hung in a fairly dim room without direct lighting, the Metal prints will look the best, displaying the most image contrast and depth regardless of lighting conditions. The size of the print can also be a factor. For the reasons just stated, Duraplaqs are a good choice for giant print sizes since you can see the entire scene without any distracting reflections. The Duraplaqs are also the most economic way to display a huge beautiful print - significantly less expensive per square inch than traditional framing or my other display options. The Metal and Acrylic-glass prints will also look absolutely stunning in large sizes, as long as they aren't hung near a bright window. The Acrylic-glass and glossy Metal prints could be considered perhaps the most immediately impressive and "sexiest" print styles I offer. The Acrylic-glass mounts have a glass-like glossy surface, much like a traditional glass-framed print but with even better image quality and a more modern, minimal display style. Because the Acrylic-glass prints are made with a real fine art paper print they have the highest level of color accuracy, similar to the Duraplaq prints but glossy. When carefully lit with gallery-style lighting, the Acrylic-glass mounts are the ultimate print display style with museum-quality perfection. The metal prints offer an equally impressive glossy look, but at more economical prices similar to the Duraplaqs. Sometimes I am asked which display option is my personal favorite. It is very difficult to answer, since I think they all look great. For large prints in a bright room, I recommend the Duraplaq mounting, no doubt. If I had an unlimited budget and a perfectly-lit museum/gallery setting I'd go for the Acrylic-glass mounted prints. But overall, considering all factors including price and variable lighting conditions, the Duraplaq mounts are my choice and by far the most popular with my collectors for good reason! If you need a print size that is not listed for sale here, that's not a problem - please contact me to request a custom size. 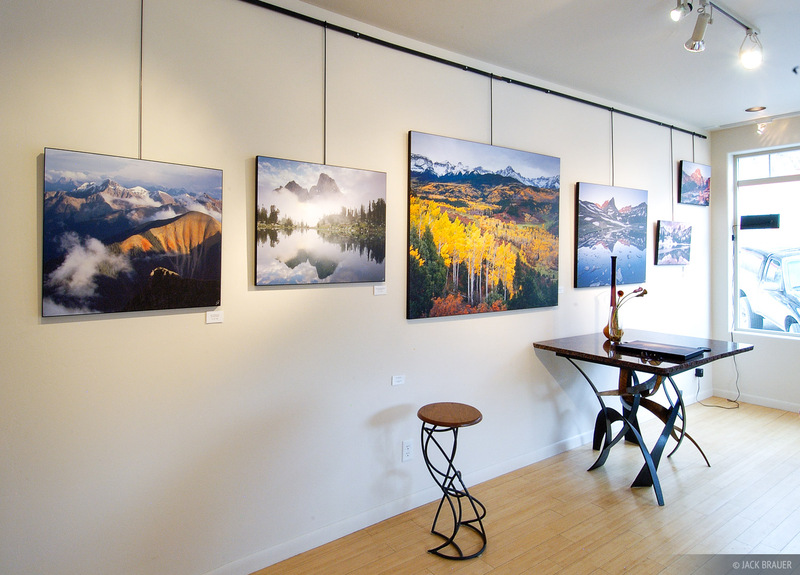 I can also provide customized print display presentations such as triptych panels and oversized wall displays. Please contact me for more information. I offer free shipping on all print orders within the U.S. The prints are packaged securely, shipped insured via FedEx, and guaranteed to arrive in perfect condition. In the rare event of a print damaged in shipping, please let me know immediately and a replacement will be sent asap. Print orders are shipped within 3-4 weeks of purchase date. In the event that I am unable to ship your order within these timeframes, you will be notified of the expected ship date and offered a refund if you choose not to wait. I offer free shipping for Metal, Acrylic, or Loose Print orders to 50 countries worldwide. Unfortunately I cannot offer free international shipping for the Duraplaq mounted prints. International print orders are produced by a reputable print shop based in Germany. These prints are also of the highest professional fine art quality, but may have slight differences compared to my equivalent American-produced mounts. Specifically, international Metal prints come with a float mount rather than the edge-to-edge black border mount. Acrylic mounted prints have straight cut edges rather than the subtle bevels of the American ones. These differences are minor and do not affect the high quality of the prints or imagery. My international prints also do not come branded with my logo on the back like the American-produced ones do. Finally, due to production and customs issues, international orders may come with an invoice or receipt that lists the production cost. I realize this is not ideal but it's better than paying $500+ in overseas shipping costs from the U.S. I am confident that you will be pleased with the quality of my prints. I offer a full refund (up to $5000, and not including return postage) for any print* returned in new condition within a week of receipt. The refund will be processed once I receive the returned print. I will replace at no charge any print that has been damaged in transit, although that is highly unlikely. * Please note that my guarantee does not apply to custom orders for items not listed for sale on my website, such as custom print sizes, triptychs, or canvas prints. All sales for such custom items are final. Refunds will not be given for prints damaged due to neglectful storage. The prints should always be stored or displayed in a dry room out of direct sunshine. 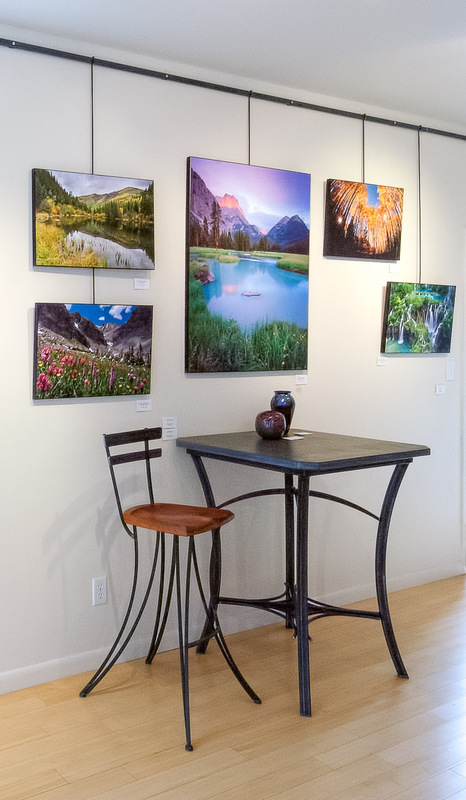 A number of my large Duraplaq mounted prints are on display and for sale in the town of Ouray, Colorado at the Skol Gallery at 812 Main Street on the north end of town. 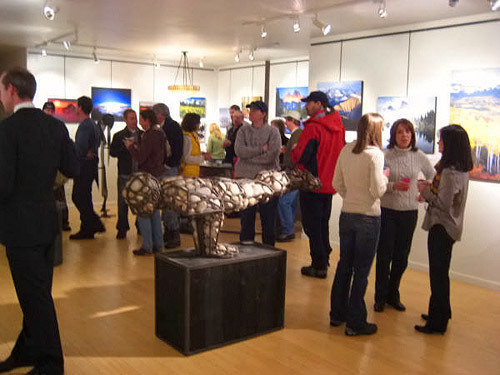 During the off-season, private showings can be arranged by contacting the Skol Gallery directly.